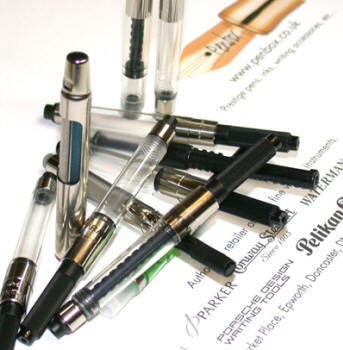 Penbox: Fountain Pen Converters for Parker, Waterman, Sheaffer, Dupont, Lamy, Cross, etc. Above are a selection of the pen converters we stock. Fit a fountain pen converter and choose from a range of coloured bottled ink not available in ink cartridges. Penbox stock a range of cartridge converters and ink for fountain pens from Parker, Waterman, Sheaffer, Dupont, Pelikan, Cross, Visconti, Caran d'Ache, Faber Castell, Lamy, Aurora and Montegrappa. Choose from the links above to view inks and fountain pen converters and fill your pen with colour.